I actually like these scarves. That's why I stocked up on them. I think I know the bonnet you mean and it fits weird around the edges. These scarves are a combo of the big triangles with better ties to me. They are great when you are wrapping your hair. You can make it as loose or tight as you want with the ties. When I am still in very straight hair mode I wrap my hair and use this to tie it down and then put a generic bonnet on top and go to sleep. Provided I did a tight wrap it looks great in the morning. Why do deals like that not exist in the UK?! I don't think these would exist in a larger urban city here. Wal-mart is good for pushing out old stock especially if it's targeted to one group. I went to the hair care section for something unrelated and saw the scarves that were selling better full on the shelf and back the regular price of 3 bucks each. Oh snap! All that for $20! That's DEFINITELY a steal! Very welcome and I felt bad as I was checking out because the checkout girl was like dang I need to check for the sale carts more. I did leave her some Hair Mayo but I think I jacked all the scarves. I so love the title of your blog. You make it easy to talk about hair and food. 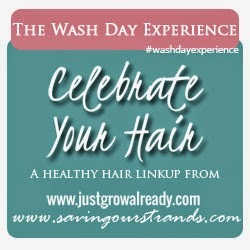 Thanks for sharing your wash day experience with us. Thanks, I haven't been good on the food lately but I'm trying to work on that. I should review the marinades I've been using lately. Quick easy and works on lots of meat. That's a great bargain for all of those stuff. Looking forward in seeing your flexi-rods sets. Fantastic bargain, I'm amazed when I actually stop and look at things what kinds of deals I can find. Or just being nice when you ask a second or third question.